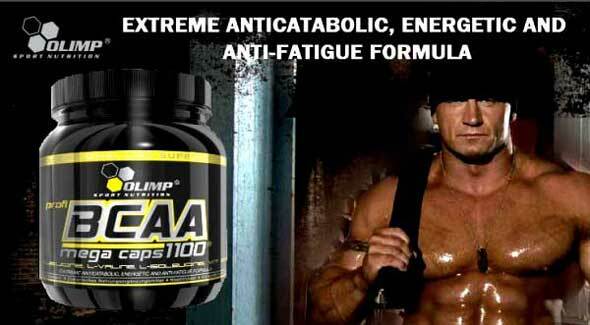 Amino AcidsOlimp BCAA 1100 Mega Caps - 300 kaps. Powerful dose of branched chain amino acids! 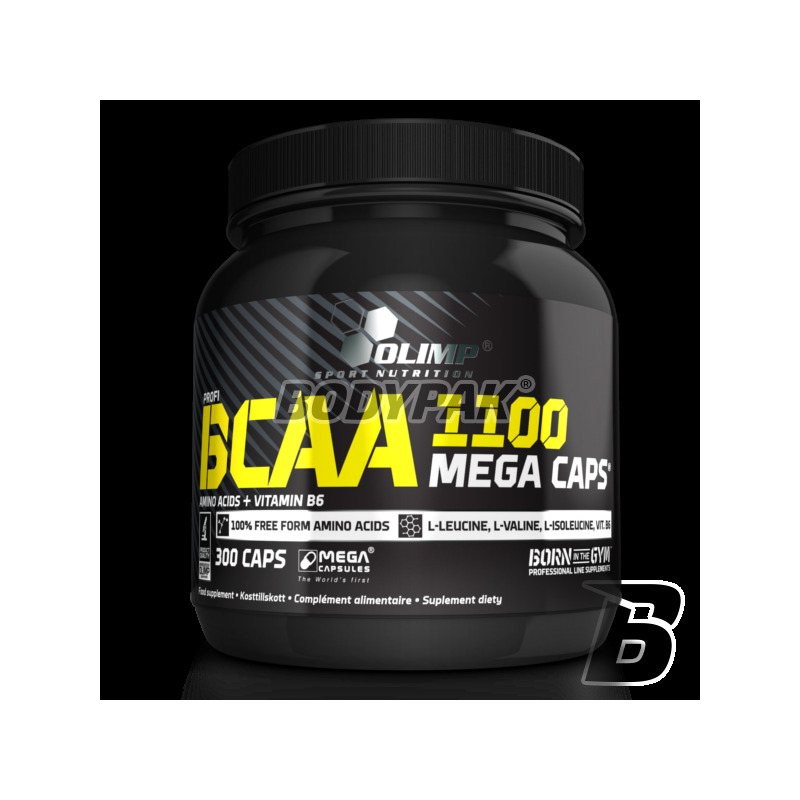 BCAA MEGA CAPS / MEGA Capsules - 1100 mg BCAA in 1 CAPSULES !!! Each capsule of OLIMP BCAA MEGA CAPS / MEGA Capsules contains more than twice the BCAA than some competitive products! PLEASE CHECK! OLIMP BCAA MEGA CAPS is exceptionally highly concentrated composition, crystalline pharmaceutical branched chain amino acids (leucine, isoleucine and valine) in a ratio of 2: 1: 1, enriched with vitamin B6, which contributes to the reduction of tiredness and fatigue. Branched chain amino acids similar to vitamins, are exogenous substances, which means that they must be provided with food (the body can not synthesize them alone). They fulfill important physiological functions, ie. Building blocks, energy and regulatory - are an approx. 35-40% of muscular tissue; - The only one, impossible to replace energy substrate, they combine fast uneconomical glucose metabolism with slow economic metabolism of fatty acids; This course of action is particularly important during exercise, especially interval - with variable intensity - one with which we are dealing in many sports, training in the bodybuilding and fitness classes; - Limit the breakdown (catabolism) and intensify reconstruction (anabolism) proteins - they improve nitrogen balance, making it faster adaptation of the exercise of athletes, especially in the disciplines of strength, in record time - and endurance - strength BCAA they regulate fat and carbohydrates - intensify disintegration and hinder the accumulation body fat storage. Intensification of fat metabolism by free BCAA takes place both at the level of systemic regulation, as well as at the level of the metabolism of fat and muscle tissue - the phenomenon is adaptive, allowing the balance of life, hunger and the long hard work. The demand for BCAA increases significantly during and after physical effort, stress reduction and diets (diet). OLIMP BCAA MEGA CAPS recommend athletes and other sportsmen and recreational athletes, to protect the power of work, speed up recovery after workouts and improve strength, weight and strength of skeletal muscle. The product should byćstosowany well as anti-catabolic in order to protect muscles against decomposition (eg. During weight loss). 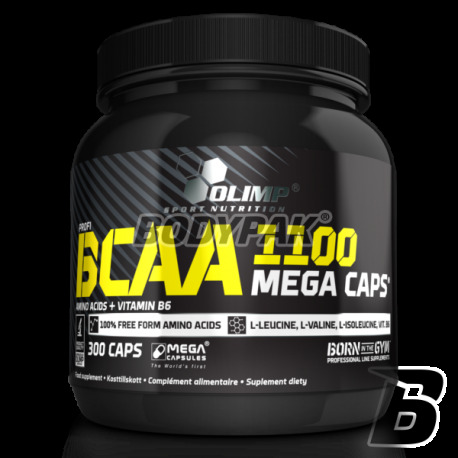 OLIMP BCAA MEGA CAPS / MEGA Capsules TO POWERFUL COMBINATION OF PHARMACEUTICAL AMINO present in one capsule !!! MEGA CAPS / MEGA Capsules OLIMP- FIRST, ORIGINAL, ONLY! 5 capsules 3 times a day - before breakfast, before training, after training or before bedtime with plenty of water. Serving Size: 3x 5 kaps. Ingredients: Free amino acids: 43% L-Leucine, 21.5% of L-valine, 21.5% of L-isoleucine; soy lecithin - emulsifier, citric acid - acidity regulator, xanthan gum - thickener, 0.02% pyridoxine hydrochloride (vit. B6), capsule (gelatin - sheath component, color: E 171). Regeneracja na plus, duże stężenie sprawia że nie trzeba połykać dużej ilośći kapsułek. Sprawdza się zarówno przed siłownią jak i przed pływaniem. Polecam. Ilość porcji przy dawkowaniu (3x5) szt to 20 a nie 60.